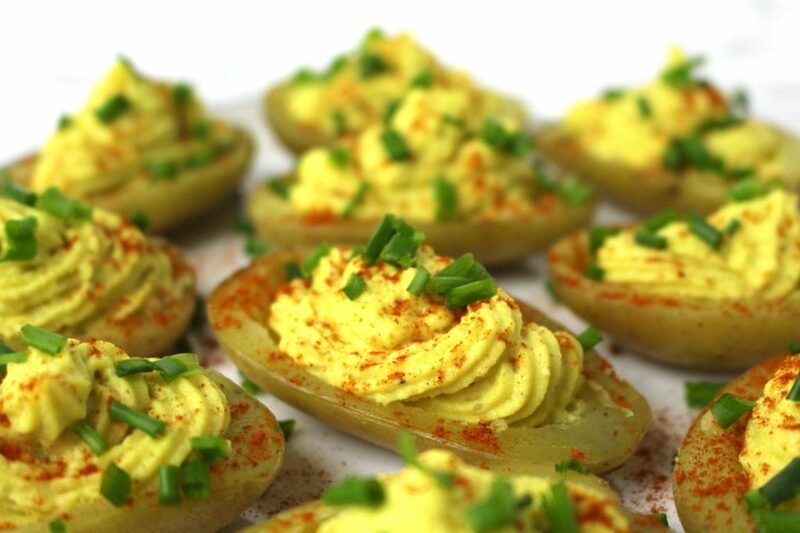 These deviled potatoes will make an eye catcher on Easter brunch. Not only do these cashew cream filled potatoes look pretty but they’re also very delicious. Plus, they make the perfect finger food for any party. As you may have assumed already, this recipe is inspired by deviled eggs, or Russian eggs. Deviled eggs or hard-boiled eggs are cut into halves and usually filled with a mixture of the egg yolk, mayonnaise and mustard. 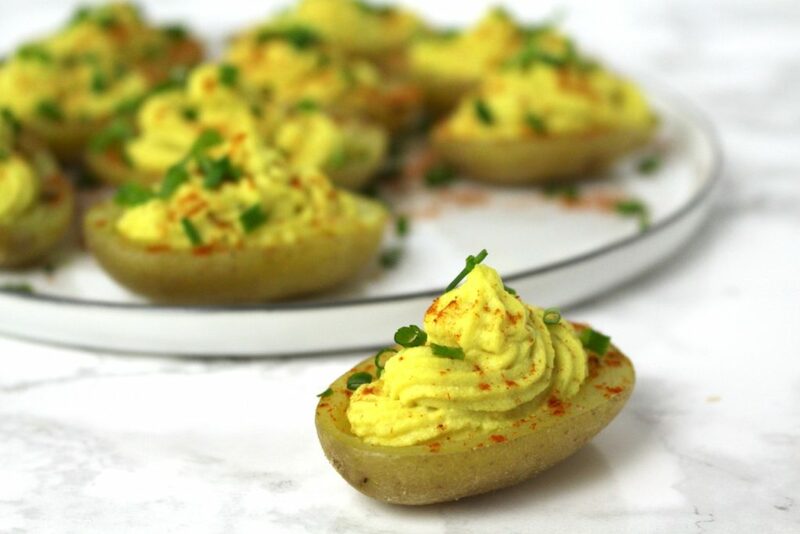 This vegan version aka deviled potatoes is a lot healthier but tastes just as sinfully good. Cashews make the filling creamy and as such complement the potatoes perfectly. 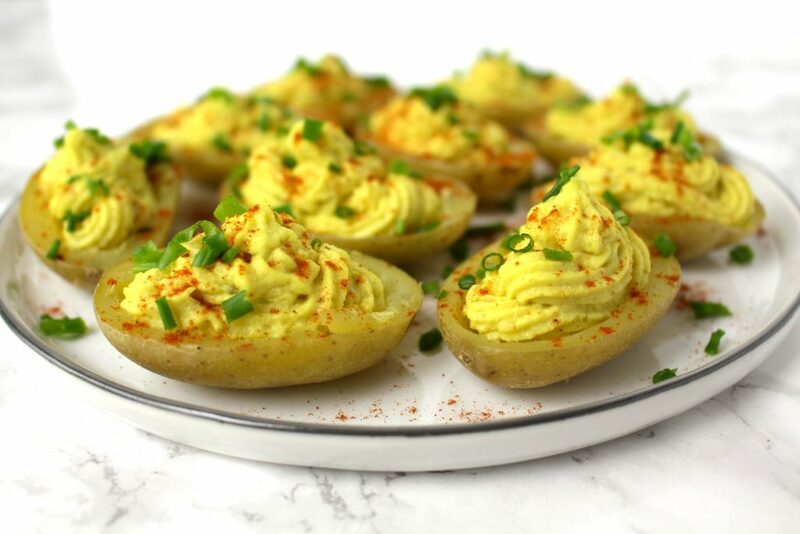 This vegan version of deviled eggs aka deviled potatoes is a lot healthier but tastes just as indulgent. Cashews make the filling creamy, and as such complement the potatoes perfectly. 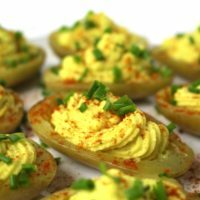 They make great finger food or appetizer for any kind of party. Wash potatoes thoroughly and halve lengthways. Place potato halves into a pot with a fan steamer (or something similar) and steam for about 20 minutes. Alternatively you can bake potato halves in the oven for about 30 minutes (rub them with some olive oil before baking). Drain cashews and place them in a blender with all the other ingredients except for paprika and chives. Blend until completely smooth. When potatoes are tender, remove them from the steamer and let cool until warm enough to handle. Scoop the centers out with a teaspoon and place into a mixing bowl (leaving just a little of potato lining inside). Mash the scooped out potato with a fork. Add the cashew cream mixture and continue to mash until well combined. Chill in the fridge for about 30 minutes. Scoop mixture into a pastry bag (or freezer bag) and fill potatoes. Sprinkle with paprika and top with chives. Keep in the fridge until ready to serve. They taste best at room temperature. Kala namak (black salt) smells and tastes pretty sulfury and therefore really reminds one of cooked eggs. I hope you love this recipe – please let me know in the comment section below! If you make these deviled potatoes, make sure to take a photo and share it on my Facebook page or on Instagram, using the hashtag #minamadefood. Oh and don’t forget to tag me (@thisisminamade) so that I can see your creations!